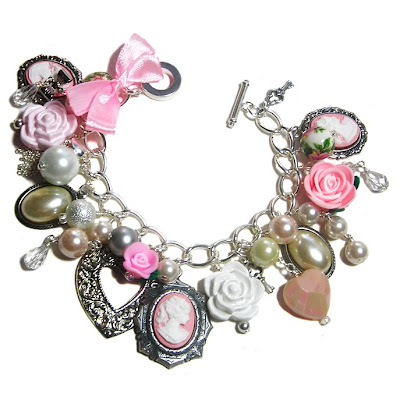 New Vintage inspired Charm bracelet- Romantic liason. With all this slippery slidey snow my thoughts are trying to turn to nicer things. I've resumed jewellery making after the Christmas break and made my first valentines inspired piece, although it's perfect for any occasion. I've reverted back to some signature elements and crammed this bracelet with gorgeous glass pearls, pink cameos, sparkly swarovski crystals and satin ribbon. There's some extra long jangly bits for more extravagance and sparkle. Find out more about purchasing any of my jewellery here. that is so cute, great job! Gorgeous bracelet - you're really talented!